Recently, I attended a speech that attempted to lay out a case that Ronald Reagan would not have been a Tea Party President. The speaker, a conservative not terribly familiar with the Tea Party movement, made an interesting case. 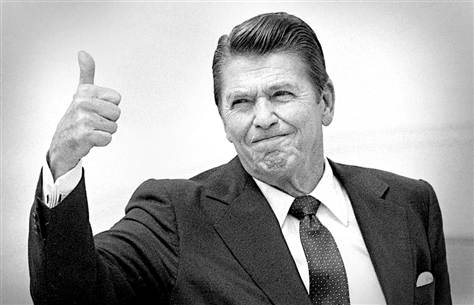 He cited Reagan's tax increases, deficit spending and amnesty granted to 3 million illegal immigrants as proof that Reagan would not have been embraced by the Tea Party. I decided to investigate the case further, and this is what I found. The speaker attempted to correlate the modern Tea Party movement with the Presidency of Ronald Reagan. He concluded that, despite the common refrain from Tea Party activists that The Gipper would be the ideal Tea Party president, Reagan's record does not hold up to Tea Party principles. In order to determine whether Reagan was a Tea Party president, one must first determine what a Tea Partier is, what the Tea Party ISN'T, and how Reagan fits into the equation. Now, when one is unfamiliar with a subject, what's the first thing one does? Google it! Type in “Tea Party”, and up pop 394,000,000 results in .43 seconds. It's a daunting task, to say the least, to narrow it down to legitimate sources only. And, sorry to say, the reference material found at the website cited in the speech leaves more questions than answers. I see a donation button and a lot of language designed to appeal to Tea Party activists, but a surfeit of information regarding its organizational structure. Luckily, they do list a phone number with a LIVE OPERATOR 24/7/365! Curious, I called the number. So on this site is a list of 15 Non-negotiable Core Beliefs. It doesn't actually say who collated this list, whether anyone actually voted on these items, or who contributed at all. Presumably, these are the core beliefs of the only individual listed on the website, the CEO of the site. Again, he'll be calling me back any time now. Look, any yahoo can put up a website claiming to represent the Tea Party and start taking donations. In fact, that sort of fraud is rampant. What I'd like to reiterate is what the Tea Party is NOT: The Tea Party is not a cynical fundraising vehicle with a website long on boilerplate and short on achievable goals. The Tea Party IS a loose coalition of many thousands of local groups that align themselves with the quest for liberty and patriotism. There are several dozen such groups here in Oregon that I can think of off the top of my head, with varying levels of organization. The Tea Party has always functioned best when it encourages activists to find their own voice and empowers them to effect real change in politics. It inspires and empowers. It encourages folks to get off the couch and get involved. And that involvement means electing politicians and holding them accountable to Tea Party ideals. Now, what are those Tea Party ideals? Do they include the minutiae from the website cited by the speaker, like Illegal aliens, special interests, English as our official language and family values? I would say that, in my experience, most Tea Party supporters believe in a mix of all of the above, but that is not to say that those are our core ideals. The core ideals are much more simple and more fundamental. FreedomWorks members know that government goes to those who show up, and are leading the fight for lower taxes, less government, and more freedom. Join us! FreedomWorks recruits, educates, trains and mobilizes millions of volunteer activists to fight for less government, lower taxes, and more freedom. FreedomWorks believes individual liberty and the freedom to compete increases consumer choices and provides individuals with the greatest control over what they own and earn. FreedomWorks' aggressive, real-time campaigns activate a growing and permanent volunteer grassroots army to show up and demand policy change. The prominent local Tea Party example in Oregon, of course, is the Oregon Tea Party PAC. At the website, oregonteapartypac.org, we see a mix of local and national news items, recent Tea Party operations and a list of political accomplishments since its founding in 2009, resources for new activists, a list of very simple principals, and, YES, a donate button. Now, of course, within these broad categories, there’s a lot of room to distill down a series of policy stances. The best way to define this is by example. Let’s take the biggest driver of Tea Party interest today: Obamacare. The Patient Protection and Affordable Care Act violates all three of the Oregon Tea Party’s stated principles – it greatly expands the size and role of government while clearly violating the constitution (John Roberts be damned); it requires the federal government to take over 1/6 of our economy and creates a command economy more akin to the Soviet Union than American capitalism while removing local and individual control over purchasing behavior; and it requires dozens of new taxes and fees, while requiring the participation of every single American citizen – sort of the opposite of fiscal responsibility. Let’s take another example: The Columbia River Crossing. That also violates all three principles. So does the expansion of Medicaid. So does PERS. So do a myriad of state and federal policies – you get the point. Please note, at this point, that nowhere in this discussion have the following issues been mentioned: an official national language, abortion, illegal immigration, military spending, or family values. This is because the Tea Party coalesces around the issues that are most dire for our national survival right now, and about which the overwhelming majority of us agree. So, based on this refined definition of what the Tea Party is, would Ronald Reagan fit in? Well, where I agree with the speaker is that Ronald Reagan’s record is not the most conservative it could have been. He engaged in deficit spending, amnesty for 3 million illegals, and some tax increases. But what one must always keep in mind is the historical context in which these actions were taken. Liberals love to kill Republicans by saying any derivation of the following statement: “You are hypocrites for criticizing Obama’s spending policies, because Bush and Reagan both were responsible for bigger debt and more deficit spending” – a true statement lacking context. Both were president during war time. In Reagan’s case, it was the Cold War, but that makes his accomplishment all the more remarkable – he destroyed the threat from an enemy without a shot being fired or an ICBM being launched. And, it must be noted, that deficit spending PALES in comparison to the levels of spending today. Indeed, Obama’s gargantuan expansion of federal spending is unique in our history, as it is exclusively devoted to domestic programs instead of a war effort. Now, the question still remains, does Reagan’s Cold War deficit spending conform to Tea Party Principles? I’d say there’s an argument on both sides, but many Tea Party activists would agree that he faithfully executed his constitutional duty to protect us from enemies both foreign and domestic. My somewhat educated guess is that this follows the spirit, if not the exact letter of Tea Party principles, but there is much debate to be had. Regarding amnesty, as this is not a Tea Party principle, it may not be relevant to the discussion. However, it’s worth noting that MOST Tea Party activists probably disapprove of this policy, but again we must remember the context. When the Speaker of the House, Tip O’Neill, is to the left of Nancy Pelosi, you don’t have a lot of room for negotiation. This also holds true for the tax increases we saw under Reagan. And speaking of negotiating, I want to touch on this point because we Tea Partiers often get a bum rap. We’re labeled as uncompromising and unable to negotiate. I reject that claim out of hand. Politicians most closely aligned with the Tea Party like Mike Lee, Ted Cruz and Rand Paul are perfectly willing to negotiate. What they won’t do is compromise on their core principles. Indeed, the core principles guide their negotiations – not the other way around. And, contrary to popular folklore, Tea Party activists generally understand that getting part of what you want instead of getting everything you want is way better than getting nothing at all. But what really drives us nuts is watching politicians give away their negotiating power right at the beginning. Giving up what the other side wants now, for the promise of something to come later, is a sure way to lose. And we hate losing. What other aspects of Reagan’s legacy are relevant to this discussion? An unemployment rate that was cut in half, the end of Jimmy Carter’s stagflation and record GDP growth that lasted well past the end of his second term. The end of the Cold War. Overall, a cut and flattening of the tax code (with an assist from Senator Packwood). A safer, more secure, more prosperous nation that rediscovered what made America exceptional. So, while I would certainly say that at times there would have been tension between the Tea Party and Ronald Reagan, and we might even have strong disagreements on elements of policy, there would have been much more to agree on than to disagree on. So yes, I believe that Ronald Reagan would have been embraced in real time by the Tea Party – that is, if Calvin Coolidge and Barry Goldwater were unavailable. A very thoughtful post. This TEA Partier thinks Reagan would be a good TEA Party candidate ... but not based on his Presidency. I base it instead mostly on his speeches and radio addresses in which he gets to spell out his beliefs. His actions as President were always in the face of overwhelming opposition from both Democrats and Republicans of the other sort. His record can be taken as the "limitations of the politically possible." His speeches and addresses were a better statement of what he'd like to have done. In these he passes on the "smaller government" and "fiscal responsibility" issues. The "Constitutional Restoration" part is there as well, but less certain. The BIGGEST thing we could do to restore the Constitution would be to restore the division of government that limited the federal government to foreign relations while the state's governments managed governing in their states. In the beginning this was largely a case of the pro-slavery and anti-slavery factions not trusting each other with a system that would allow either to take control of the whole nation. Today it is the socialists known as liberals versus the "Conservatives". But the "Conservatives" are not all of one mind on the issue of State Domestic Authority vs. a less activist but still centralized Federal Domestic Authority. For the latter, the political struggle is an "all-or-nothing" proposition just like the socialist's goal. The problem is that the socialists can always promise to do more things for more groupings of people, while the "conservative-federalists" can only offer to get off their backs and out of their way. Constitutional Originalists don't always understand that they are supporting a diversified response in which we may have both states as Conservative as Montana or Texas and states as "liberal" as Massachusetts or New York ... but they are. would Reagan have been a "Conservative-Federalist" or a "Conservative Originalist"? .... I sure don't know, but I think the man that said "government is not the solution to our problems" would have gone with the TEA Parties. With another year comes another federal budget season, kicked off by President Obama’s budget proposal. Although his plan was shockingly delivered by the date required by law (for only the second time under Obama), perhaps the president and his team should have taken a few extra days to think it through. The proposal they released today is so shockingly tone-deaf and immune to fiscal realities that it would be comic if we weren’t talking about the actual future solvency of the United States government.